Yep! I ate too much last night, and I have a stomachache today. （The verb　飲む（ = nomu) means “to drink” but we also use it to take medicine. 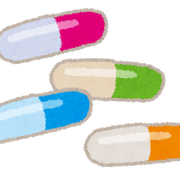 In Japan we can buy over the counter medicine like pain killers, cold medicine at a 薬局 ( = yakkyoku) , pharmacy. For the more seriously sick, we go to the doctor or hospital and either get medicine there directly or get a 処方箋 ( = shohousen) =prescription and go to 処方箋薬局 ( = yakkyoku) pharmacy where they deal with prescription medicine. Basically there are two kinds of medicines. = medicines for internal use which you take when it is necessary like pain killer. 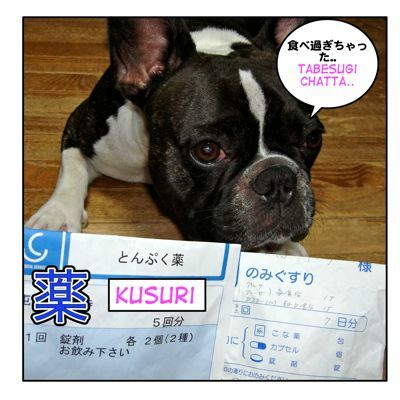 Besides とんぷく薬 ( = tonpukuyaku) , we are supposed to take medicine regularly. Almost all the medicine has these notes outside of the box or envelope. =Minasan mo tabesugi niwa kiwotukete kudasaine. =You should be careful not to eat too much either! = yakkyoku de kusuri wo kaimasu. That is why we can not depend on google translator yet. Thank you for visiting this site. I am very happy to hear you enjoy studying Japanese. As for your request, I thought about making a lesson on that theme before but since there are so many medical terms and they are tough, I was reluctant to make one. But I will add it on the request list. Meanwhile please check this 風邪 lesson where I explained how to express your symptoms. You’re welcome! Thank you for visiting this site! !ochame!